BERKELEY, CA  When we hear the term “MRI,” most of us probably think of a special treatment room in a hospital with a huge doughnut-shaped machine that costs a lot of money and makes a lot of noise. Researchers with the U.S. Department of Energy’s Lawrence Berkeley National Laboratory (Berkeley Lab) are looking to change that perception with the successful testing of a laser-based MRI technique that would make the technology compact and portable, relatively cheap, and quiet. Shoujun Xu, a member of the research group of Berkeley Lab chemist and NMR/MRI expert Alexander Pines, conducted the measurements that demonstrated a new low-cost, portable MRI technology. Pines led the development of this new MRI technique along with Dmitry Budker, who holds a joint appointment with Berkeley Lab’s Nuclear Science Division and UC Berkeley’s Physics Department. 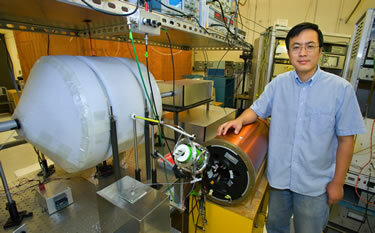 Shoujun Xu, a member of Pines’ research group, conducted the MRI measurements. The three were co-authors of a paper about this technique which appeared in the Aug 22 edition of the Proceedings of the National Academy of Science (PNAS). Other authors of the PNAS paper were Valeriy Yashchuk, Marcus Donaldson and Simon Rochester. MRI, which stands for magnetic resonance imaging, and its sister technology, nuclear magnetic resonance (NMR) spectroscopy, are based on a property of atomic nuclei with an unpaired proton or neutron called “spin.” Such nuclei spin on an axis like miniature tops, giving rise to a magnetic moment, which means the nuclei act as if they were bar magnets with a north and south pole. When exposed to an external magnetic field, these spinning "bar magnets" attempt to align their axes along the lines of magnetic force. Since the alignment is not exact, the result is a wobbling rotation, or “precession,” that’s unique to each type of atom. If, while exposed to the magnetic field, the precessing nuclei are also hit with a radiofrequency (rf) pulse, they will absorb and re-emit energy at specific frequencies according to their rate of precession. When the rf pulse is combined with magnetic field gradients, a spatially encoded signal is produced that can be detected and translated into images. Obtaining a spatially encoded MRI signal from a sample depends upon polarizing the spins of its precessing nuclei so that an excess points in one direction, either “up” or “down.” Conventional MRI technology uses an exceptionally strong external magnetic field to produce a detectable signal. The stronger the magnetic field, the stronger the signal, which means a large and expensive cryogenic high-field magnet. This volume of water was imaged using an MRI technology based on remote sensing and optical atomic magnetometry. It was developed under the leadership of Berkeley Lab scientists Alexander Pines and Dmitry Budker. A smaller magnet results in less polarization and a weaker MRI signal, which therefore requires a more sensitive means of signal detection. One alternative being explored is the use of SQUIDs (superconducting quantum interference devices), which can detect the faintest of magnetic signals but must be cooled to a temperature of near absolute zero. This requirement makes SQUIDs expensive and somewhat tricky devices to use. It also limits the situations in which they can be effectively deployed. The alternative MRI technology being developed by Pines, Xu, Budker and their colleagues is also highly sensitive to low-field magnetic signals but offers the enormous advantage of being operable at room temperatures. This new laser-based approach to MRI is derived from two technological advances. One, developed by the Pines’ research group, physically separates the two basic steps of MRI, signal encoding and detection. Physically separating these two steps enables each to be optimized for sensitivity. 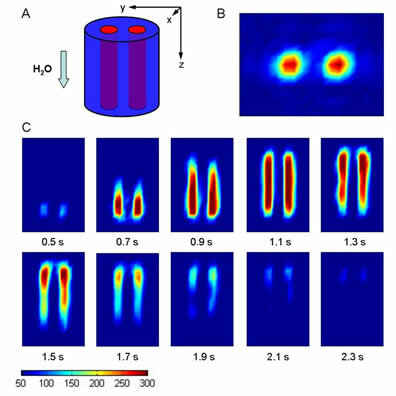 The other advance, developed by the Budker research group, is a highly sensitive atomic magnetometer that’s based on a phenomenon called “nonlinear magneto-optical rotation.” With this magnetometer, a sample of alkali atoms featuring a single unpaired electron is vaporized in a glass cell. The unpaired electron makes the atoms themselves act like spinning bar magnets, with a magnetic moment three orders of magnitude stronger than that of precessing nuclei. A beam of laser light “pumps” the atoms so that their spins are polarized, then “probes” the polarized atoms for an MRI signal. According to Budker, instead of the multimillion dollar costs of a conventional MRI system, this alternative MRI technology would cost only a few thousand dollars to implement. 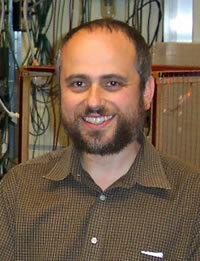 Dmitry Budker is a staff scientist with Berkeley Lab’s Nuclear Sciences Division and a professor of physics at UC Berkeley. In the MRI system that the Berkeley researchers tested, the fluid to be imaged, water, was passed through two small cells for signal encoding, then transported to a U-shaped detection area for interrogation by a pair of Budker’s magnetometers. The magnetometers were oriented so that they detected the MRI signal with opposite signs. This configuration dramatically improved the signal-to-noise ratio, enabling the researchers to detect an MRI signal from microliters of water in 0.1 second without the presence of a strong magnet.